We have a choice: We can build safely and properly so as to not exacerbate existing problems caused by improper construction and development, or we can continue to do business as usual and build an unsustainable future of misery, waste, and needless destruction. 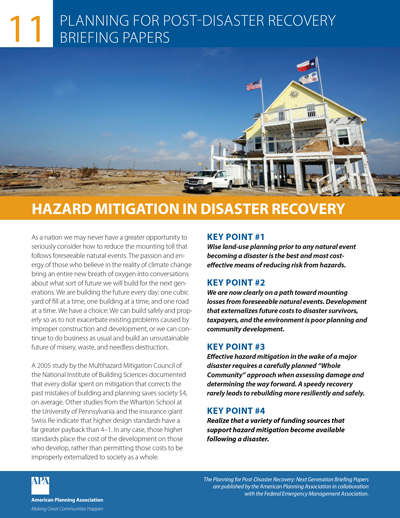 This briefing paper outlines studies documenting that every dollar spent on mitigation correcting the past mistakes of building and planning saves society $4, on average. Studies indicate that higher design standards have a far greater payback than 4–1. Those higher standards place the cost of the development on those who develop, rather than permitting those costs to be improperly externalized to society as a whole.